A few weeks ago, I did an article for the Ithaca Voice about how wages in Ithaca are only slightly higher than peer communities in upstate, yet they pay a lot more in rent. This article isn’t going to focus on that, although I could certainly add a few more pages (or at least fix the embedded graphs issue in the first article). This “topic of the week” piece is intended to be more of a “fun facts” about the Ithaca labor market. The data comes from the Department of Labor here. All figures date from May 2014. – The major category that employs the most people in Ithaca is no surprise – “Education, Training and Library Occupations”, with 15.49% of the jobs in the Ithaca metro (the BLS estimates this category to have 7,660 jobs locally, but that would suggest only about 49,430 jobs in the region when their numbers elsewhere say 70,000…make of it what you will). This turns out to be the highest percentage for any metro in the entire country. This category, which includes professors, teachers, librarians and teaching assistants, averages pay of $80,700/year locally, versus $46,660/year nationally. Not only is Ithaca the metro with the largest percentage of educators and librarians, it’s also the one with the highest wages – Ann Arbor (U. of Michigan) comes in second with $79,500. Ithaca’s quintessential college town vibe is strong. – The occupational category with the highest average pay is no shocker either – Physicians and surgeons, who employ about 80 people locally and average a pay of just over $233,000/year. The national average is only a little lower at $224,000/year. They are followed by the 40 or so dentists in the region making an average of $205,000/year (national average $167,000/year). – On the other end of the scale, fast food cooks make the least – the 140 estimated by the BLS make about $18,680 per year. Food prep, delivery drivers and laundry workers all make less than $20,000/year on average, and amount to 1,380 workers. The median salary for all jobs in the Ithaca area is $52,020/year. – Some other rankings where Ithaca comes in the top 10 of the nation’s 381 metros: professional chefs (8th highest concentration in the nation), microbiologists (7th highest concentration), psychologists (5th) and editors (4th – here’s looking at you, Jeff). – Now here’s a fun category – location quotient. Basically, how many times more likely a certain type of worker is in a given area versus the national average. For example, my field, atmospheric and space scientists, has a location quotient of 107.36 for the Boulder, Colorado – in other words, atmospheric and space scientists are 107.36 times more common in Boulder than the national average. This is why we have a joke in my field that Boulder is like Mecca for atmospheric scientists – you have to visit at least once before you die, otherwise you can’t go to Heaven. 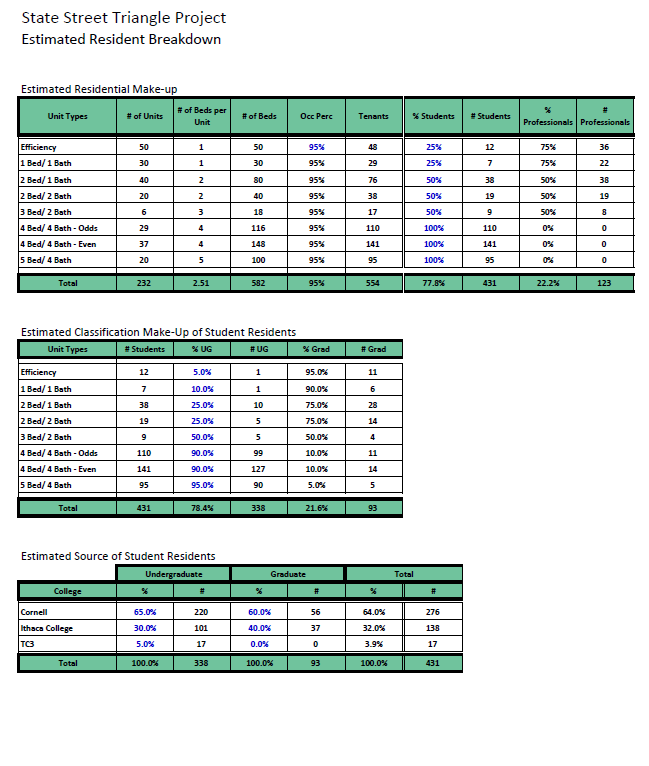 So what fields have the highest location quotients in Ithaca? Economics professors (24.53), Physics professors (14,49) and Fundraisers (14.03). And yes, Ithaca has the highest concentration of people in those fields out of any metro area in the country. Now I know why Cornell is so persistent with its donation solicitations. 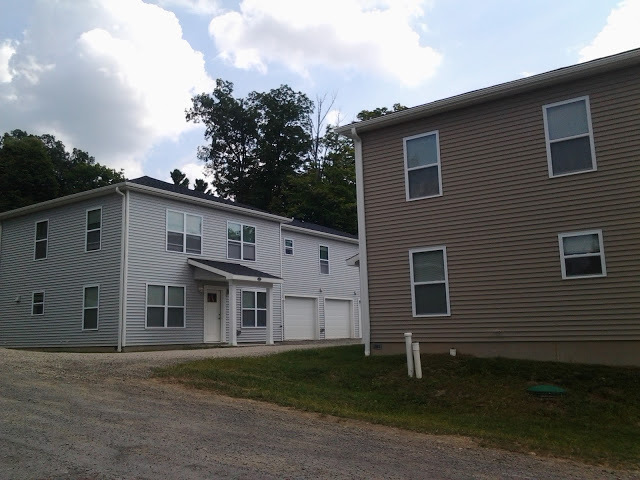 Last week, Ithaca mayor Svante Myrick and county Legislator Martha Robertson issued an opinion piece on the need for more housing, and especially affordable housing, in the city and county. There were two, fairly simple reactions to the article – readers believed it and agreed there was a housing issue, or they thought it was bunch of lies. Being a data-driven person, I decided to delve a little deeper into the numbers behind Myrick and Robertson’s claims. 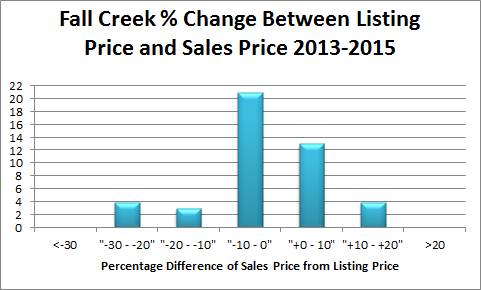 Let’s start with the 2006 housing study that was cited in the article. 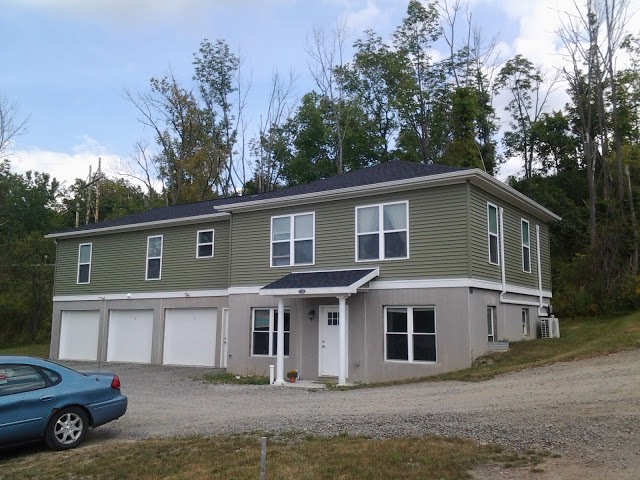 According to that study, performed by Vermont-based Economic & Policy Resources Inc. (EPR), 2,127 rental units and 1,767 owner-occupied units would be needed by the end of 2014, for a total of 3,894. These numbers were determined using the 2005 housing deficit (871 units), economic trends and population/demographic trends. Some readers may remember the quote of “4,000 units of housing” cited in news pieces back in the mid-2000s, and this is where it comes from. Using data from the U.S. Housing and Urban Development’s State Of the Cities Systems (SOCDS) Database, new housing permits were pulled for the same time period as the study’s projection, 2006 to 2014. 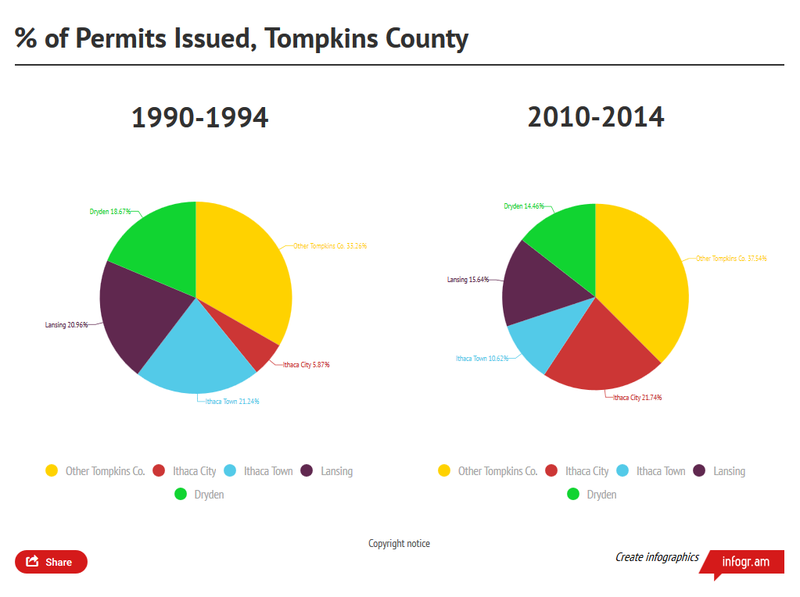 From 2006 to 2014, Tompkins County added 1,124 single-family homes and 910 multi-family housing units (apartments and maybe a few co-ops or condos), for a total of 2,034 housing units. In what is a surprise to no one, the majority of multi-family housing was built in the city of Ithaca, and the majority of single-family homes were built in surrounding towns. 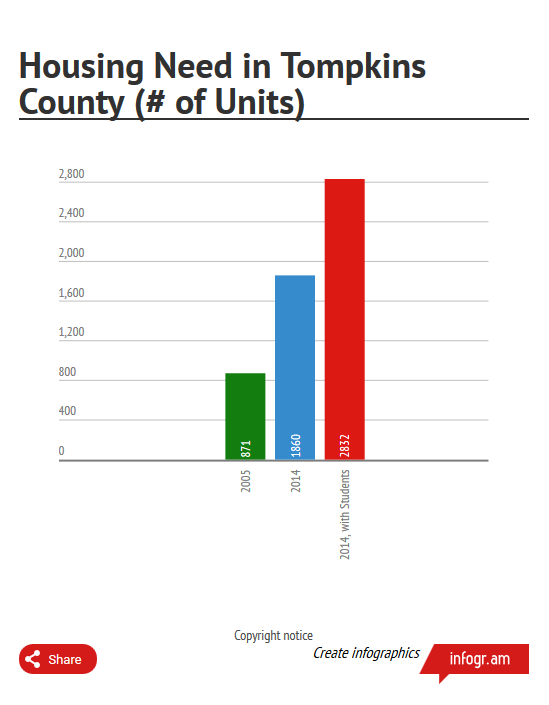 The county had 40,069 housing units in 2006, so in that nine-year span there was about 5.1% growth in housing units, to 42,103. 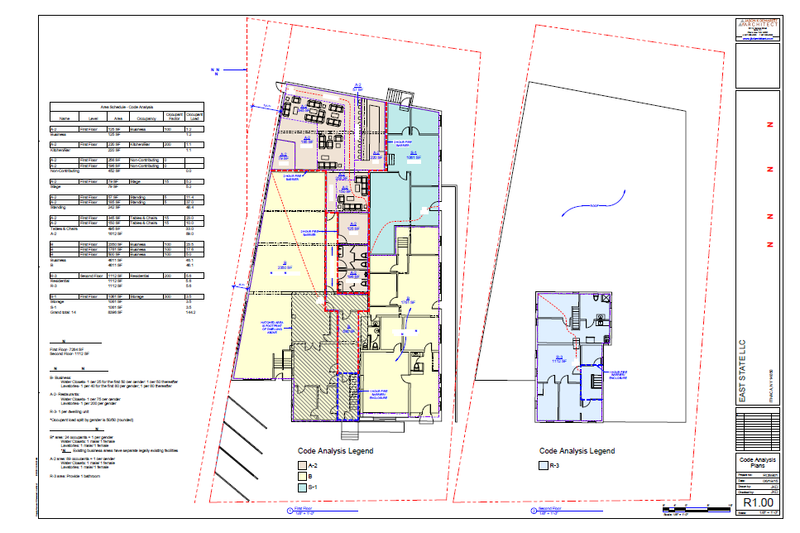 The EPR study stated that 3,894 housing units would be required. With 2,034 units actually built, that means only 52% of the housing needs identified by the study were met. Breaking it down further, homeowners, occupying mostly single-family properties, fared a little better – with 1,124 built of the 1,767, that meant 63.6% of the homes that were needed based on 2006-2014 projection were built. However, for rental units, which are mostly multi-family housing, it was only 910 of the 2,127 needed – 42.8%. Not even half. This wouldn’t be a problem if the economy slowed down or population growth leveled off, but neither of those occurred. Even with the recession a few years ago, job totals have increased quite a bit, with over 6,000 jobs have been added to the county since 2006. 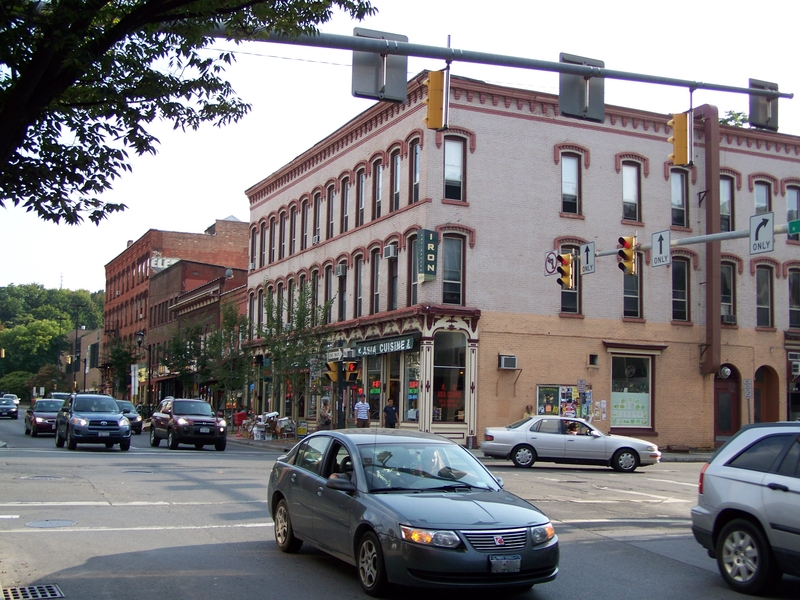 The population has also increased – Tompkins County had 99,997 residents in 2006, and in 2014 it was estimated to be 104,691. Rather oddly, the county added 3,049 housing units from 1997-2005, the previous nine-year period, but only 3,482 residents. Population growth has climbed even as housing construction has dropped. Perhaps most importantly, the 2006 EPR study never accounted for changes in student population. It assumed net zero change for the purpose of the study, which focused on permanent residents. Unfortunately for the housing situation, there’s been a huge growth in student population. 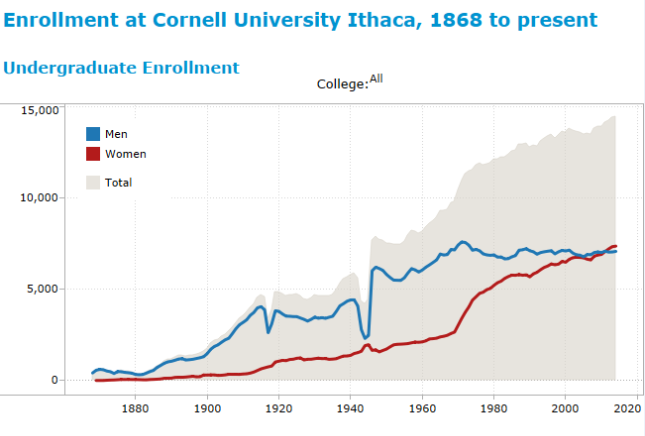 Cornell added 2,040 students from 2006 to 2014. Ithaca College added a more manageable 178 students. 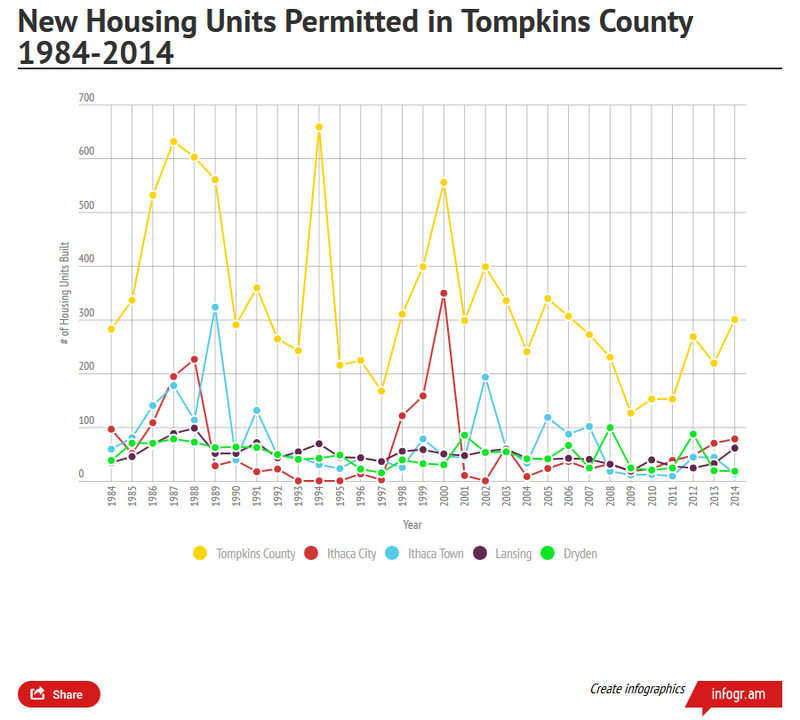 According to the U.S. Census Bureau, the average rental unit in Tompkins County houses 2.14 people. 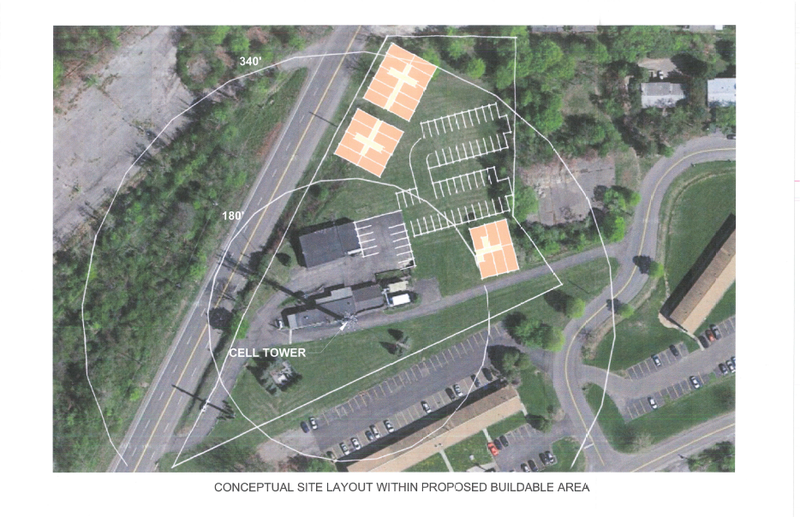 The county’s staring down 1,036 units it didn’t plan for, and as noted in the opinion article, Cornell plans on increasing its enrollment further. 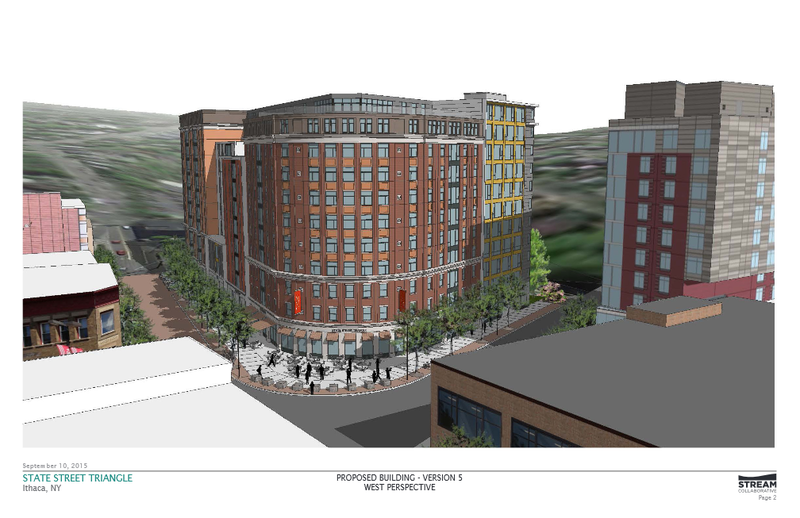 For the record, IC has added student housing in the period from 2006 to 2014 – an addition to the Circle Apartments south of campus, which opened in 2012 and increased campus housing capacity by 138 beds. 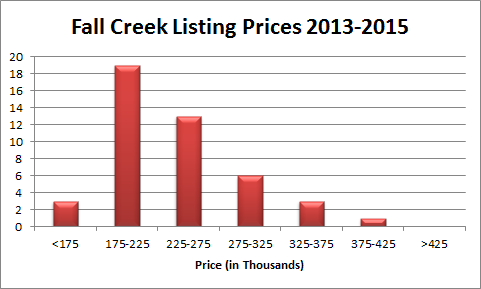 While South Hill students are driving up housing demand, the overall impact is minor. In contrast, when Cornell rebuilt its West Campus Housing during the 2006-2014 time period, there was no net increase in the total number of beds. The Big Red has had no gain in student housing since new dorms opened on North Campus in 2001. With the impending closure of the 480-bed Maplewood Park student housing complex, the situation may get worse. No one can force Cornell to build new housing, but their burgeoning student population does add a substantial strain to the market. 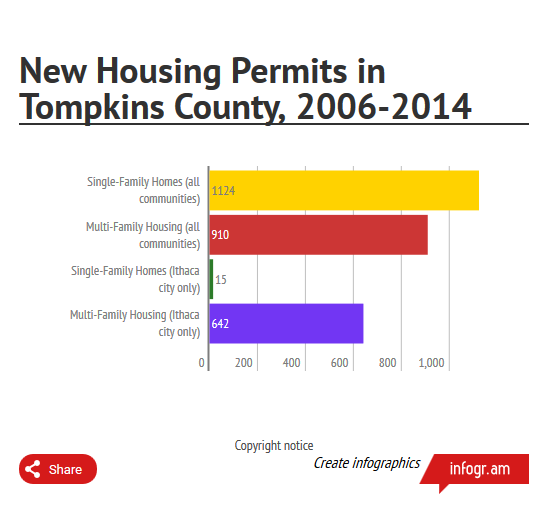 Given the numbers above, Tompkins County fell 1,860 units short of its 2014 housing goal; add in the unexpected influx of college students, and the number rises to 2,832. It wasn’t good to have some affordability problems when the county was 871 units short of a balanced market in 2005; at the 2014 deficit of 2,832 units, the impacts become much more severe, which is why housing affordability has become such a big issue. Myrick and Robertson’s column might be an opinion, but the statistics give their opinion a lot of weight. All facts come from Ithaca College’s Office of Institutional Research. All enrollment values are for the fall semester of a given year, i.e. 2001 means fall 2001. 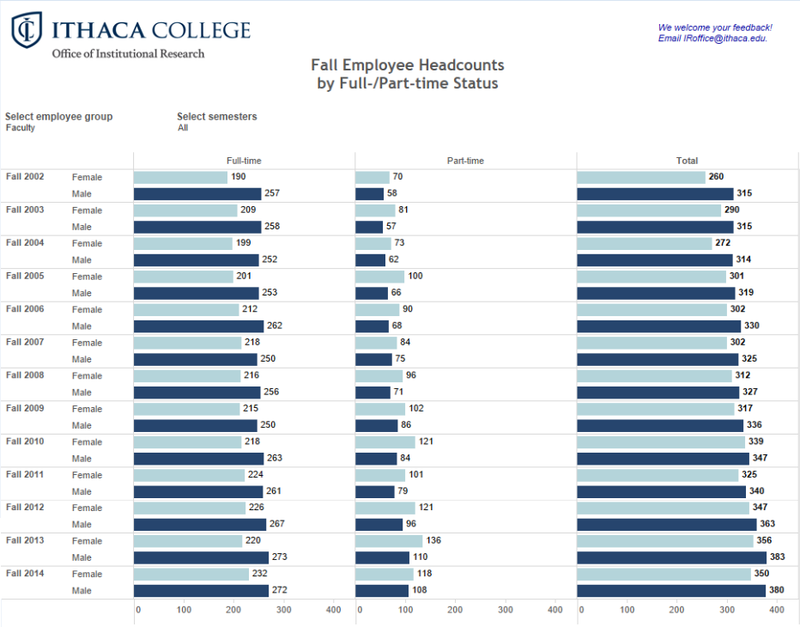 Since the blog has previously taken a look at Cornell’s faculty and staff headcounts, it seems only fair to take a look at Ithaca College’s as well. Over the past decade or so, Ithaca College’s employment has grown. Since 2002, headcount has increased by 302 people/20.1%, about 1.68% per year on average. During the recession, employment at the school actually increased at a faster pace than the average, a stark contrast to the hundreds of jobs that were cut at Cornell. Breaking the numbers down into faculty and admin/staff components, faculty employment has grown by 155/26.96% since 2002, somewhat faster than the 147 person/15.86% growth in staff employment. For the sake of comparison, Cornell employed 7,075 non-academic staff in 2002 and 7,018 in 2014, a 57 person/0.8% decrease. The Big Red also employed 2,756 faculty/academic staff in 2002, and 2,763 profs and lecturers in 2014, a 7 person/0.3% increase. (note, Cornell numbers are for the Ithaca campus only). In other words, we have over the past decade or so, one school that has seen only small enrollment growth but large employment growth, while the other has seen large enrollment growth and no employment growth. I can’t vouch for whether one school’s grasp of their situation is better than the other, but the differences between the two make for an engaging conversation piece. Here’s something more apropos to current events – the split between full-time and part-time faculty at IC. In 2002, 18.41% of male faculty and 26.92% of female faculty were part-time. In 2014, 28.42% of male faculty and 33.71% of female faculty were part-time. Although Ithaca College has added 155 faculty over 12 years, only 57 of those positions are full-time. Part of the the growth in part-time faculty can be attributed to the growth in graduate students, who are considered part-time faculty at IC if they are teaching. But regardless, it’s clear that Ithaca has become more reliant on part-time staff to meet its teaching needs. Not to take an official stance on any union-organizing, but double-checking with some previous Voice write-ups, the graph above means that there were 226 Ithaca College faculty that were earning no more than about $16,000/year. Cornell doesn’t have part-time faculty listed in their data, but I assume grad students with TA assignments fill that role. As of 2014, 6.6% of non-academic staff at Cornell (468 of 7047) are considered part time, while 25% of non-academic IC staff (268 of 1074) are part time. So maybe that’s another piece in the conversation comparing schools. I give what’s probably an unfair amount of attention to Cornell. Part of it is because that’s the campus I know. But Ithaca College has its impacts and influences on the local community as well. 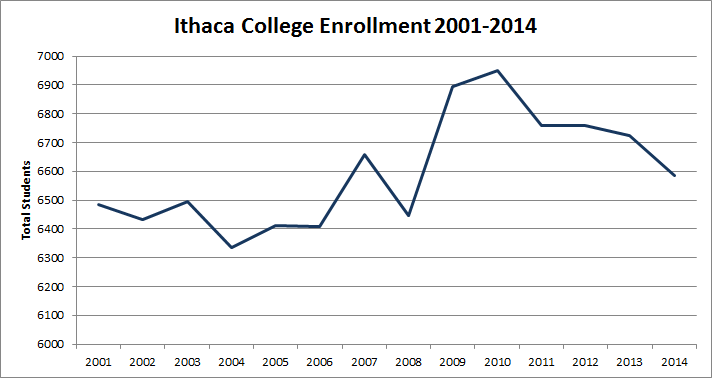 Today will take a look at Ithaca College’s enrollment over the years. One thing that is clear looking at Ithaca College’s recent enrollment totals is that on the whole, there has only been a modest increase in enrollment in recent years. Enrollment was fairly flat during most of the 2000s, grew a few hundred students during the Great Recession, and has been dropping in recent years. You put a best fit line on this and you get a best-fit line of the equation (student population = 30.374(years out from 2001)+ 6368.5). 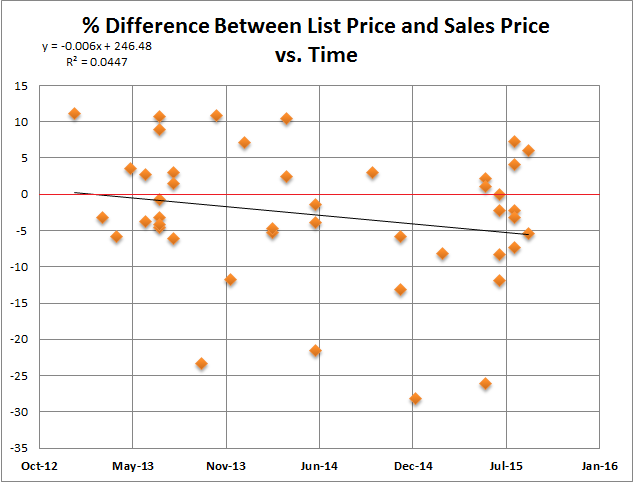 But the best-fit line is by no means a good predictor in this case. IC strives to be all residential college, and these fluxes have put a strain on its resources and ability to “run lean”. The college offered students $1500 incentives to live off-campus during fall 2005, as they were forced to convert lounges into dorms. The skyrocketing enrollment in 2009 forced the college to construct a temporary dorm at a cost of $2.5 million, and even offer a few incoming freshmen $10,000 to defer matriculation. As a general observation of Ithaca’s housing issues, the spotlight can be shined directly on Cornell, whose enrollment has increased by nearly 2500 students since 2005. 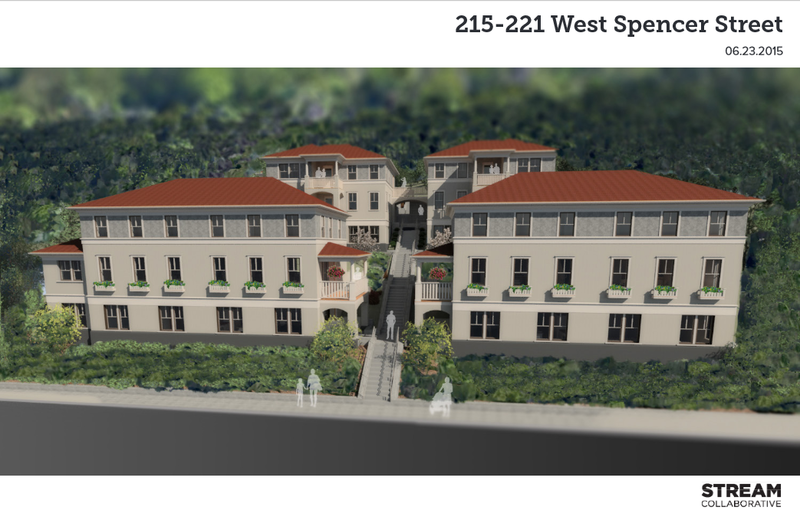 There hasn’t been much private housing built for IC students in recent years (perhaps a few dozen units), and barring the occasional over-enrolled year, there hasn’t been as much need for private student housing on South Hill. Recent trends noted, historically Ithaca College has grown by leaps and bounds. Apart from a small drop in enrollment when the school was moving into its new South Hill digs in the early 1960s, enrollment continued to swell all the up to about 1991. when it enrolled 6,443 students. 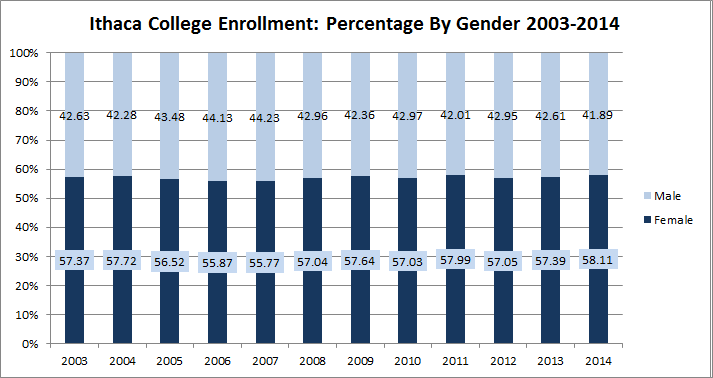 Enrollment fell 12% to 5,688 in 1994, before slowly rising back up in the late 1990s and early 2000s. 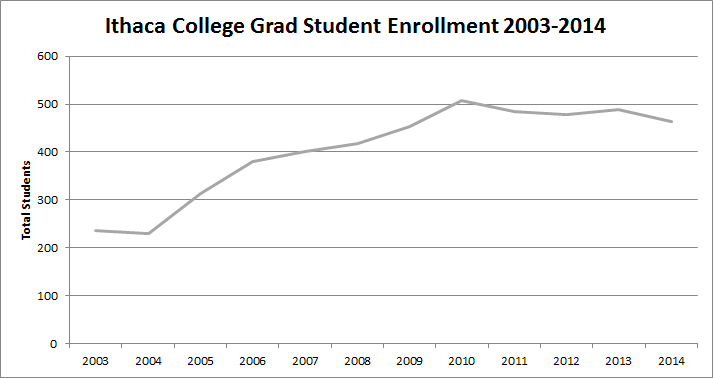 Looking at graduate student enrollment, there was a substantial increase during the 2000s, climbing from 230 in 2004 to 507 in 2010. 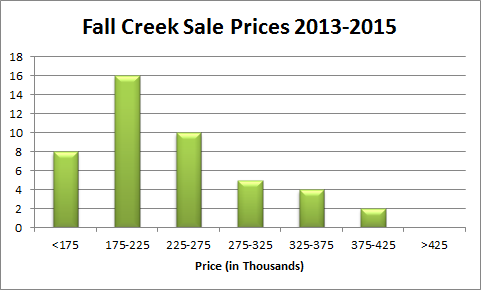 Since then, however, the number of grad students enrolled on South Hill has tapered down to 463. One thing that has stayed fairly consistent over the past decade is the proportion of gender on the Ithaca College campus. The gender split is typically 42-44% male, 56-58% female, with this year having the highest female proportion in recent years, just like Cornell.